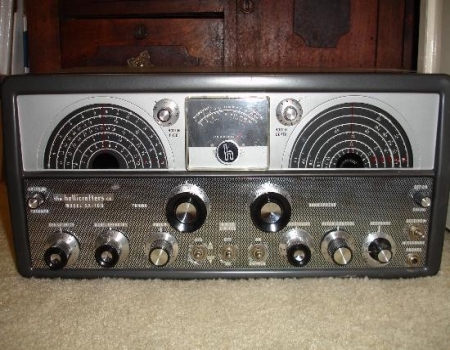 The Hallicrafters SX-100 is a 14 tube and 4 band dual conversion receiver covering 538khz to 1580khz and 1.72mhz to 34mhz. The I.F. frequencies are 50.5khz and 1650khz. The features of this receiver include a calibrated bandspread for 10 through 80 meters, selectable side band(USB/LSB), BFO, ANL, Antenna Trimmer, Crystal filter, a delayed AVC, Variable Selectivity from 500hz to 5khz, an S-meter, Notch filter, 100khz crystal calibrator and gear driven fly wheel tuning with Aluminum dials. The power source is 120 volts AC or 120-240 volts AC with optional universal power transformer. 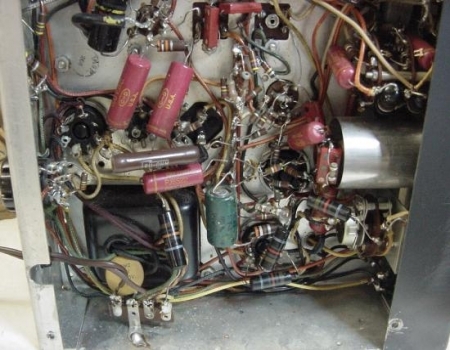 The tubes that are used are as follows, a 5Y3 = Rectifier, OA2 = Voltage Regular, 6K6 = Audio Output, 6SC7 = 1st Audio & BFO, 6BJ7 = Detector, AVC and ANL, Three 6BA6 tubes used as the 1650khz IF, 2nd Mixer and 50.5khz IF, Two 6AU6 tubes in use as a 1st Mixer and Crystal calibrator, 6CB6 = RF amplifier and a 12AT7 as the 2nd Conversion Oscillator. The production run produced a Mark 1, 1A and 2, 2A with very slight differences between them. 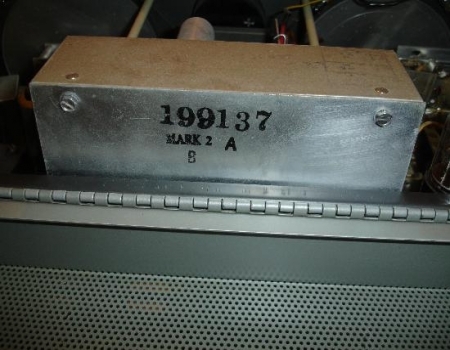 The receiver featured on this page is the Mark 2A version. 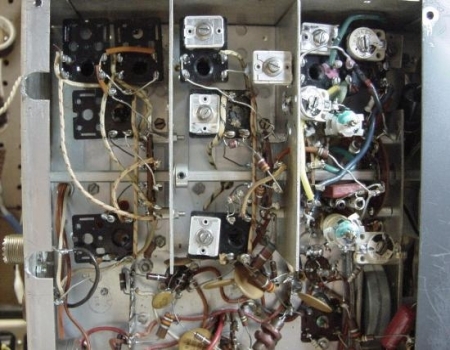 The photograph on the left shows the receiver with the "hood up" and looking down on the complement of tubes. The photograph on the right shows the production run which is the MARK 2A version. 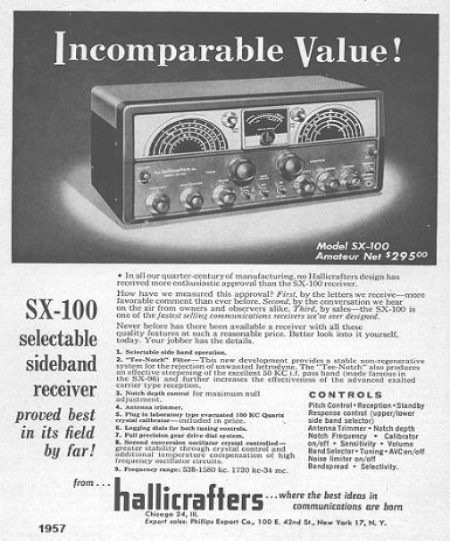 A 1957 Hallicrafters ad featuring the SX-100. Click on the sales ad for a full page picture. These pictures show an underneath view of the chassis. 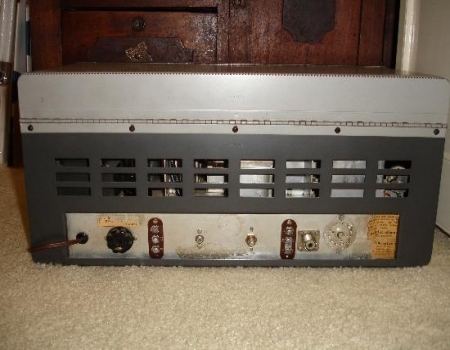 The pictures show the receiver in an unrestored condition. Them pink wax/paper capacitors have been replaced with orange drops. The silver colored metal can on the right side of the left photograph houses the BFO assembly. 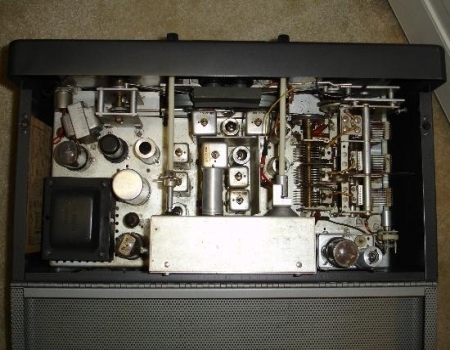 The picture on the right is of the RF deck of this SX-100.